In just a few days we will be over and done with our last pace with our current curriculum – ABCs with Ace and Christi. This is the second program in the “preschool” curriculum of School of Tomorrow. The first being Preschool with Ace and Christi. Time flies so fast! After this program, we can go on right ahead and get on with the first level a.k.a. Grade 1. 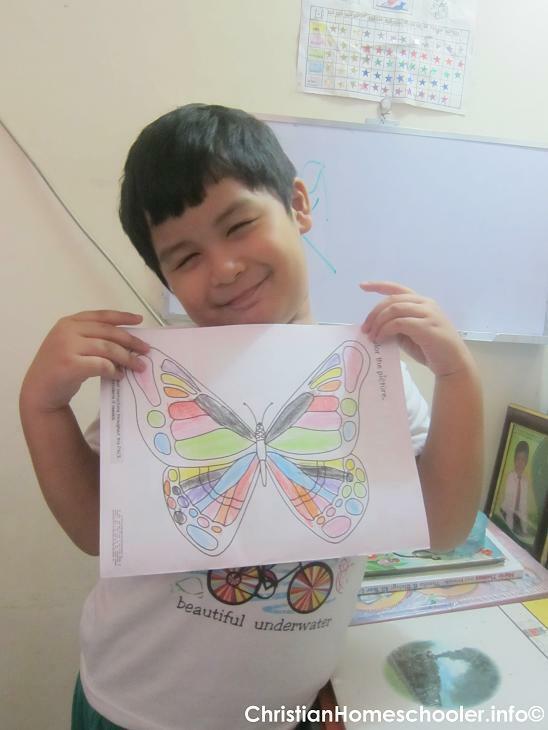 I took this picture yesterday as he finished the story of Try Try Butterfly. This little kiddo has improved a whole lot since we started. While some montessori programs teach students to do cursive writing at 4 years old, I’d rather not be so uptight on those stuff just yet. I allow my son to work at his own pace. The stress of learning and studying might be inevitable in the future. But I want him to enjoy as he learns for now and he’s doing good so far. The progressive approach that the program that we use works best for us. Like how the tracing using the index finger of letters as opposed to having the child write on paper right away made a lot of sense as we went on. Writing is something that, should I say is not yet a piece of cake for him. But I think he is doing pretty good on Word Building and comprehension wise, I am one happy teacher mama. Mistakes usually happen when he does things in a hurry. But otherwise he’s good. We won’t be enrolling our son right away to Level 1. I guess we both need a break from the program, much like how my face could use an anti wrinkle eye cream from all those sleepless nights. I work from home. So the stress can be overwhelming sometimes. But I’m not complaining. We are in no way in a hurry. He’s only but 5 years old anyway. We’ll probably head on to enrolling him in a soccer clinic or Taekwondo as we transition to Level 1. And then there are some advanced lessons too that we can do as we get this little guy prepped for the next level.